Make It Grand is the first in a series of DVDs from the Peter Merry series we are throwing on the DJzone Bench. Even though the video itself was probably recorded over 10 years ago, most all of the ideas and content are timeless depending upon your wedding client. Peter starts out by explaining the importance of personalizing the entrance and how few that are attending the wedding really know who all the major "players" are and how they are "connected". 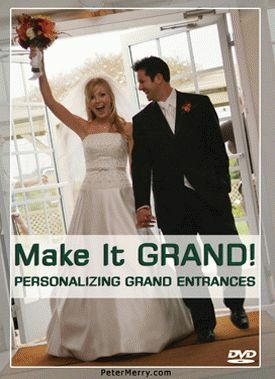 By giving the wedding party a more in-depth informative entrance, you are connecting with the guests and that connection allows you to "own the room". This ownership will then translate into better control of the room making it easier to get people dancing and paying attention to the little things that your clients want you to point out like the cake cutting, etc. Peter points out that the East Coast mobile DJs have little or no problem getting that connection since the people attending weddings are trained to connect and celebrate. This DVD is geared more to mobile DJs operating in the mid-west to western side of our country. Packed with some unique ideas and information that can lift your level of performance, we give Make It Grand a 4.5 stars. The half star was lost due to the quality of the videotaping and lack of HD, not due to lack of value or content.